Feeling hungry? No worries make instantly some delicious hot pasta / noodles with noodle maker, a cute new cooking game. Eat vegetable, meat or a mix of both, delicious healthy homemade organic noodles. 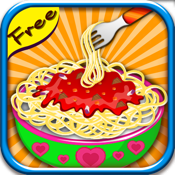 Noodles are not difficult to make with this fun free maker / cooking game for the whole family. Girls and kids would especially like this game as girls like to cook and bake. •Cut some veggies, meat and cook. And yes do not forget to let us taste your hot pasta @ socialinkstudio@gmail.com or if you had any trouble making it. Have Fun!